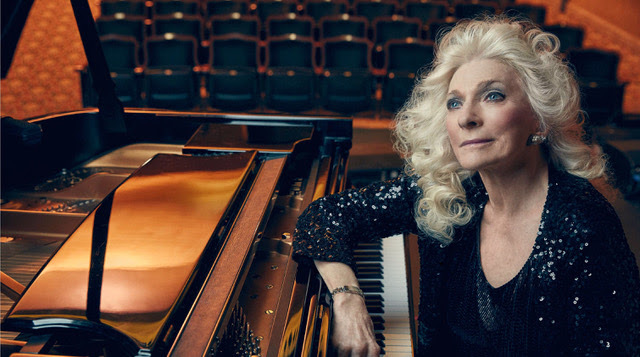 (New York City, Jan. 21, 2019) — Internationally acclaimed singer-songwriter and Grammy Hall-of-Famer, Judy Collins will be honored at the 34th Annual Bistro Awards on Monday, March 11, where she will be receiving the Bob Harrington Lifetime Achievement Award, the Bistro Awards’ highest honor, for her six decades of musical accomplishments. 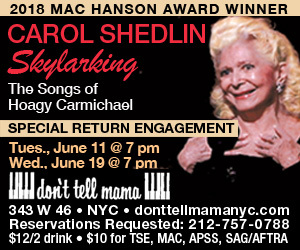 Collins, a classically trained pianist, self-taught guitarist, and singer, possesses a soaring, ethereal-yet-earthy soprano and eclectic taste that have allowed her to move back and forth easily through folk, pop, rock, standards, cabaret, and show tunes across 60 years of recordings and performances. Beginning in the 1960s, she championed artists like Bob Dylan, Leonard Cohen, Phil Ochs, Joni Mitchell, and Randy Newman. Her own writing skills have produced songs that rank with the iconic songs she has covered. Her recordings of such hits as “Both Sides Now,” “Send In the Clowns,” “Someday Soon,” and “Chelsea Morning” are part of the fabric of American music; her 1967 album Wildflowers is in the Grammy Hall of Fame. Collins has created a musical legacy second to none and she shows no sign of slowing down, recently releasing a CD and DVD of her personal interpretations of the songs of Stephen Sondheim, and in 2017, with her writing partner Ari Hest, receiving a Grammy nomination for Best Folk Album for Silver Skies Blue. Judy Collins is an artist for whom the term “legend” is not only deserved, but an understatement. The Bistro Awards gala will be held on Monday, March 11 at 7 pm at Gotham Comedy Cub, 208 W. 23rd St., produced by Sherry Eaker, who has headed up the event since its inception in 1985. A full list of winners will be announced at the end of January; tickets will go on sale at that time at www.BistroAwards.com.